When working in performing arts tech, or as part of a stage crew, basic black is the common, near-universal uniform of choice. Why? Because it's your job to disappear into the darkness backstage. Performers are out in the light. You're the Batman of the performing arts — disappearing into the shadows instead. If you’re on a budget and simply working on a smaller production, you should be fine simply to dress in all black — preferably in comfortable, slightly stretchy clothes with a bit of "give" in them. Crew work is about serviceability, not style. So make sure you leave the jewelry at home — it will only distract the eye or even catch on things at the worst possible moments. This goes for watches too. Wear a stopwatch or watch around your neck to call the show, or to keep track of time. Nice black cargo pants or slacks with some stretch are actually better than jeans or denim, unless you'll be working on building or moving a lot of scenery around, in which case, a tougher material provides protection against injury. But if you're serious about crew work, or if you'll be working in a professional scenario, go ahead and invest in at least two pairs of black tactical pants. Available in brands like Taclite or 5.11 and more, these pants are incredibly durable yet offer enough "give" for wearability and comfort, are available in a tear-resistant variety, and are also available treated with Teflon to reduce staining. My favorite thing about these pants for crew work is the fact that they offer a multitude of hardy, roomy pockets (fabulous for crew work) — perfect for holding everything from flashlights to your mini-flashlights, multi-tools, tape, pens, and more. Get several different shirt styles to cover you for comfort, as well as for casual versus formal work — a nice black tee with some stretch, and a long-sleeved polo shirt is always a must. Many of us have experienced the discomfort of summer rehearsals in a space without air conditioning. For hot weather, it's important to wear light fabrics that are breathable and have some give. With this in mind, Tactical pants also come in more lightweight varieties for those seeking to keep cooler as well. For casual work scenarios, black tennis shoes, canvas shoes, or dock shoes are typically fine. While I realize that this plants me firmly in the Eighties, meanwhile, I actually prefer black high-top sneakers, which offer ankle support and increased coverage against snags, bumps and trips. For professional scenarios, wear a nicer black rubber-soled boot or shoe, and make sure to rough up or treat the soles so that they're non-slip — and silent. If they clomp onstage, they're not the right choice. Depending on your work scenario, it's not a bad idea to keep tactical or neoprene kneepads on hand. Make sure your pants are roomy enough to accommodate them — most tactical pants will accommodate them just fine. You also might consider getting additional items like a padded heavy duty work belt (like those from Setwear), as well as black work gloves, a chest pack, utility pouch, and more. Headgear is typically frowned upon in any professional or semi-professional crew scenario, but hats are usually fine in rehearsal or other more casual workday scenarios. 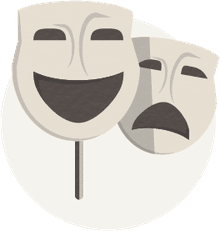 Meanwhile, if you'll be moving scenery on or offstage or witnessed by the audience, some professional scenarios will even provide gloves and even masks to keep you as anonymous and unobtrusive as possible. For each event you work, you'll need to slightly vary your stage crew attire depending on the scenario. For relaxed professional scenarios from the office to rehearsals, meetings, and more, relaxed attire is often acceptable. For meetings, rehearsals, work calls, strikes, and load-ins, dress standards are typically more relaxed, allowing for jeans, or slightly more casual attire. While the rule on shorts varies by organization or venue, it's generally not a good idea to wear them even when allowed. 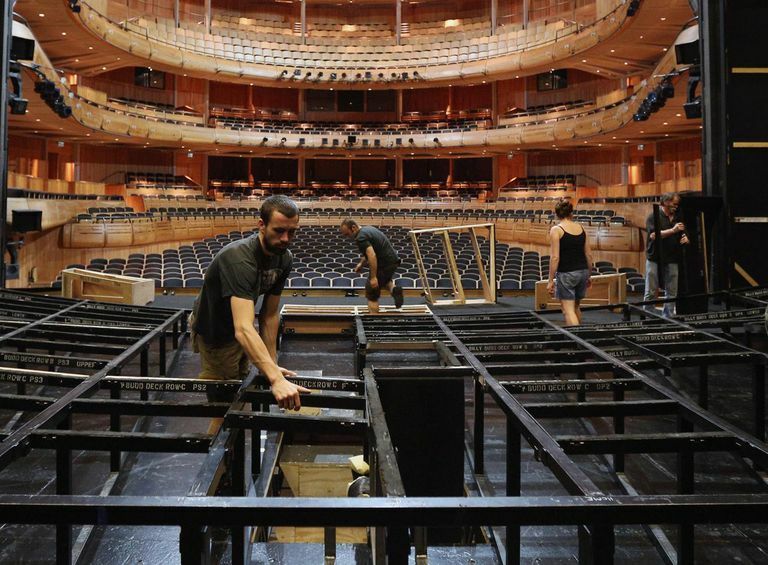 Stage crew work involves frequent exposure to objects under construction, rigging, electronics, and, generally, objects with sharp edges or the tendency to carry current! It's better to be safe than sorry — even in hot weather. Jeans or other tough material, meanwhile, will protect you against cuts and scrapes, especially during scenarios like load-in or striking the set, etc. For performances, or for any official work scenarios at the official venue, the uniform should involve the standard black work slacks or pants, and a black polo, tee or pullover style shirt. If your venue is sub-zero (or just feels like it), keep a black jacket on-site, too. If your crew job will also involve interaction with the public — whether in the ticket booth, or assisting with refreshments, programs, or official show gear, you should wear a nice black button-down shirt along with a tie. If you're going to be working on stage crews on a consistent or basis, whether you're an amateur or professional, your most practical solution is to keep at least two versions of your formal and casual stage crew attire available, keeping a clean version of each ready to wear on-site at all times. Store the dressier version in a way that allows it to stay neat and unwrinkled. Press it if you want to go that extra mile. If you're working on a professional production, your crew togs will often be provided for you, with cleaning costs covered or handled on-site. In those scenarios, the expectation is typically that you are expected to change into the uniform upon arrival to the rehearsal space or venue, and to change back into your own clothes before leaving each day or evening. Official gear like this will typically include a company logo on the breast or pocket. Rules and regulations for what to wear when can vary depending upon your crew scenario — by whether your production is union or non-union, as well as by state law. Make sure you’re informed and respectful of the rules at each organization you work with. Working on a stage crew can be exciting, stressful and fun. Wearing the proper clothing will not only signify that you’re professional and prepared, it will also protect you in many scenarios as well.